Spot price silver followed gold higher yesterday once again, as the correlation between the two commodities seems to have been reestablished once again, with silver ending the day with a relatively wide spread up candle which closed well above all three moving averages at the $19 per ounce price level, with $20 per ounce now clearly in sight before the end of the year. 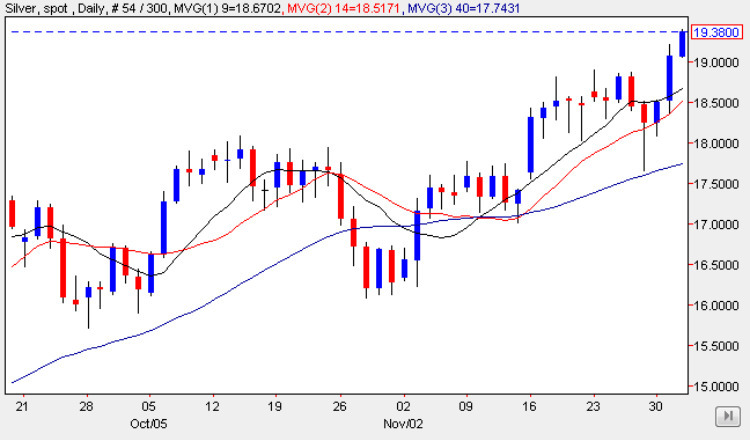 With the deep congestion now firmly breached on the daily silver chart, and with all three moving averages now adding their considerable support to the move, the upwards trend for spot silver looks increasingly well developed, and with the potential support region now below, we have a safety net in place should silver prices reverse in the short term. However, given yesterday’s strong perfomance, and with gold prices continuing to surge higher, the outlook at present is very bullish as we look towarsd a strong close to the year for the industrial commodity.